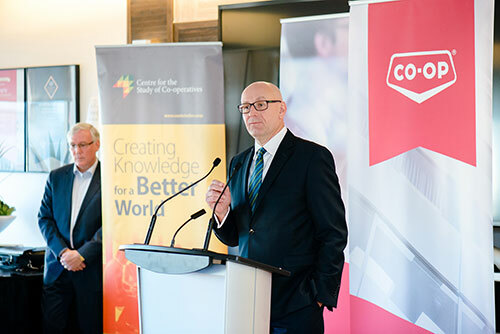 A five-year, $5 million commitment from the Co-operative Retailing System (CRS) will provide critical start-up funding for Co-operatives First, an organization that will facilitate a new wave of co-operative development in Western Canada. As a non-profit, the newly formed Co-operatives First will work with small- to mid-size rural communities and municipalities, as well as with aboriginal communities, to identify innovative, community-led solutions to modern challenges and opportunities facing these communities. “Co-operatives played a vital role in building Western Canada and they remain fixtures in communities across our country,” said Federated Co-operatives Limited (FCL) CEO Scott Banda, who presented the donation on behalf of the CRS, which is comprised of FCL and more than 200 independent retail co-operatives across Western Canada. A portion of the $5 million in start-up funding will be used for resources to offset some of the costs associated with starting a co-operative. Those funds will help new organizations attain the legal and professional services required to form a new co-operative, as well as develop communications and business plans and conduct feasibility studies. Co-operatives First is one outcome of the Co-operative Innovation Project (CIP), a two-year, FCL-funded pilot project at the University of Saskatchewan’s Centre for the Study of Co-operatives. As part of the project, researchers conducted telephone and web surveys and held meetings to gauge the public’s understanding of co-operatives. In total, the researchers contacted 649 communities, representing 37 per cent of rural and aboriginal communities in Manitoba, Saskatchewan, Alberta and British Columbia. The CIP found rural and aboriginal communities are receptive to locally driven solutions, but needed assistance getting started. The project determined more co-operatives would be formed if individuals and groups received greater support. Once its executive director and staff are in place later this year, Co-operatives First will begin hosting Community Inspire meetings with community leaders across Western Canada to identify potential opportunities for development and collaboration. The organization is planning to host nine such meetings in 2016. By 2020, the group plans to have held no fewer than 125 Community Inspire events in rural communities and 40 in aboriginal communities.